Cleanser - Cleanse away aging dullness and boost radiance with this skin-brightening, pH balanced facial cleanser. Formulated with our own Intensive Skin Brightening Complex containing Madonna Lily Plant Stem Cells, Bearberry, Niacinamide, Green Tea and C-Ester, this natural, pH balanced formula leaves skin clean, healthy and glowing. Ideal for skin showing signs of uneven pigmentation, discoloration, sun damage, freckles, age spots and dark spots. In a 4-week consumer trial on the full Evenly Radiant® line, 82% of participants saw improvement in overall color and tone of skin. 100% vegan, cruelty-free, paraben-free, sulfate-free, mineral oil-free, lanolin-free, gluten free, GMO-free. Day Creme - Boost radiance and even out skin tone with this skin-brightening daytime moisturizer with full spectrum UVA/UVB protection. Formulated with our own Intensive Skin Brightening Complex containing Madonna Lily Plant Stem Cells, Bearberry, Niacinamide, Licorice, Green Tea and C-Ester to help fight discoloration for a brighter, more luminous complexion. Ideal for skin showing signs of uneven pigmentation, discoloration, sun damage, freckles, age spots and dark spots. In a 4-week consumer trial on the full Evenly Radiant® line, 82% of participants saw improvement in overall color and tone of skin. 100% vegan, cruelty-free, paraben-free, sulfate-free, mineral oil-free, lanolin-free, gluten free, GMO-free. When I first received these products in the mail, I was immediately impressed with the amount of product you receive. For under $16, you receive 6 fluid ounces of the cleanser and for under $30, you receive 2 fluid ounces of the day creme. After seven weeks of use, I still have over 1/4 of the cleanser and I have barely made a dent in the day creme. That's a definite plus in my book. As I began using the products, I fell in love with the scent. They have a subtle citrus smell that is clean and refreshing without being overpowering. I have combination skin and these products were the perfect balance for my skin type. They were cleansing yet still left my skin moisturized. 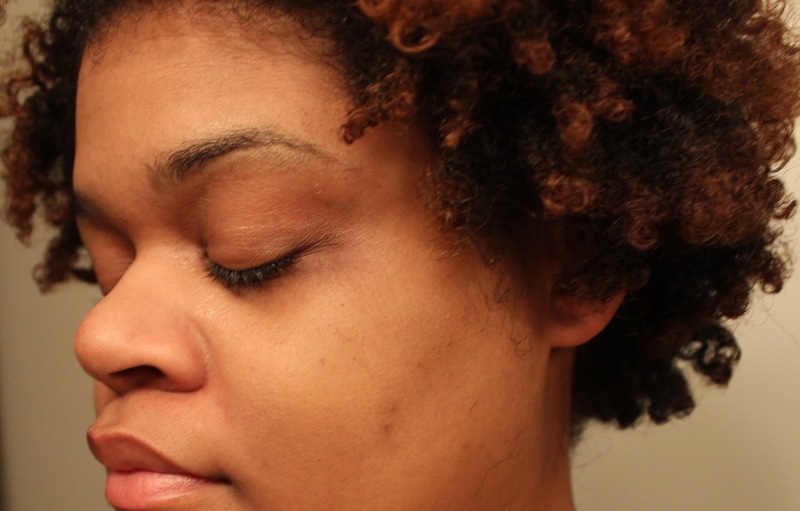 At first, I didn't notice much a difference in my hyperpigmentation, but after six weeks, I noticed that my skin was glowing and some of my hyperpigmentation spots were in fact lighter and beginning to fade. You may notice some slight redness in my after photo. This was due to a pimple that was going away. I'm excited to see how my skin will look with continued use. YES! I am so impressed with these products. Not only did they lighten the hyperpigmentation on my cheeks, they are long lasting and smell great. If you have oily skin, the moisturizer may not help block oil, but using a face primer or mattifier will keep your skin from becoming too oily. I think these products are perfect for anyone looking to create more even, glowing skin. 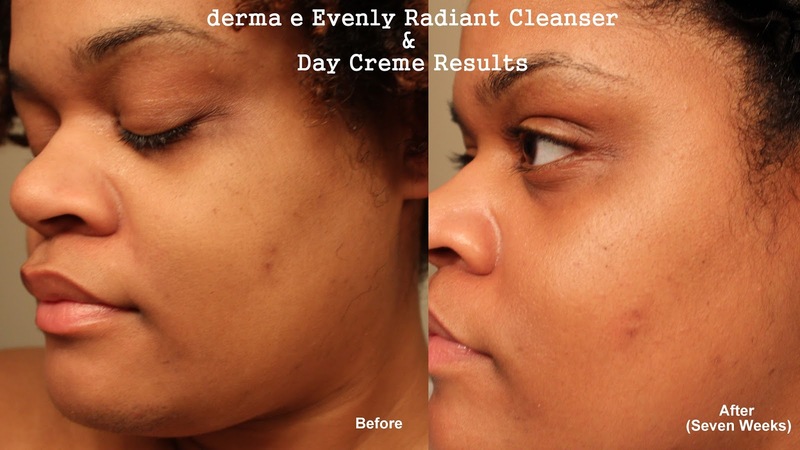 Have you heard of derma e? Would you give the Evenly Radiant Line a try? To learn more about derma e Evenly Radiant, click here. Actually, derma e Evenly Radiant products are sold at A LOT of brick & mortar stores, including Whole Foods Market, Sprouts and Sally Beauty, to name a few! I have super oily skin, and I never realized how important it was to be moisturizing even still. It's amazing how much my skin has improved and I'm always looking for a 'good to skin' moisturizer. I am always curious about finding new washes for discoloration! Thanks for sharing!!! I need to find a new cleanser. I want something that is natural too. I need to check this one out. I've never heard of this brand so I'll check it out. I totally agree that skin care is THE most important step in a makeup routine. I never, ever, ever go to sleep with makeup on and I've taught my daughters to never skip the cleansing and moisturizing. I've never heard of this brand! But I'm totally obsessed with skin care and too scared to try anything on my face except for Mary Kay or Clinique.Great review! I have never heard of this brand before. I really need something to even out my skin. I think you may really like this brand. You can find it in a lot of local stores; plus, you can see how much more radiant my skin was in the second picture. I think you would like the glow it gives. Thanks girl! I really like Mary Kay and Clinique. Over the past few months, I've been trying more natural skincare lines and you would be surprised at how gentle yet effective they are. If you ever want to try something new, I think you'd like this. I hate that sometimes I fall asleep with my makeup on. *hides face* I always tell others that washing your face at night is super important! Thanks for checking out my review Alli! I think you would really like this Sonya. I believe most of their products are all natural so even if this one isn't the one you try, the others would work great too. No problem! Thanks for checking out my review! :-) I really think this cleanser helps give skin a natural glow so you may like it. Yes! For awhile, I thought oily skin meant little to no moisturizer needed. I was so wrong. I'm amazed at how much I have been able to improve my skin and control oil by drinking water and proper skincare. Thanks for checking out my review!